Danger reads a file Dangerfile that contains the checks (ruby code). It exposes a set of useful environment variables like the PR title, the files that changed,… It also exposes methods to report the result of these checks warn(), fail(), message(). Once Danger completes it sends a comment to the opened PR with the results (as you can see in the screenshot below taken from the article mentioned). When I tried the tool I felt that adding all the Ruby logic in a single Dangerfile was going to turn the file into a big mess. What about having a danger folder with all the tasks? Then we could require these tasks from Dangerfile and execute them one after another. The steps below show how I ended up doing it. It doesn’t mean it’s then only way. There’re probably some other alternatives. This is the one I tried and that worked with our project structure, keeping all the danger checks in their own folder. First create a folder danger where all the tasks/checks will be. # This Danger step checks if the number of line is over a maximum value. raise "-execute method must be overriden"
If you want to use warn, message, fail methods and environment variables you can access them from the @dangerfile attribute. PRSize: Checks if the number of lines in the PR is over a given value. IncludeSpecs: Checks if any new .m file includes unit tests. Todo: Checks if the developer forgot any // TODO somewhere in the code. Ping: Analyzes modified files and notifies developers that might be directly concerned about these changes because they, for example, own the feature whose file has been modified. There’re manual processes that are unavoidable, even though, tools like Fastlane & Danger are helping to automate the majority of them. When we’re so focused on our projects we don’t worry that much about the time we spend in repetitive tasks (since we only think about developin). 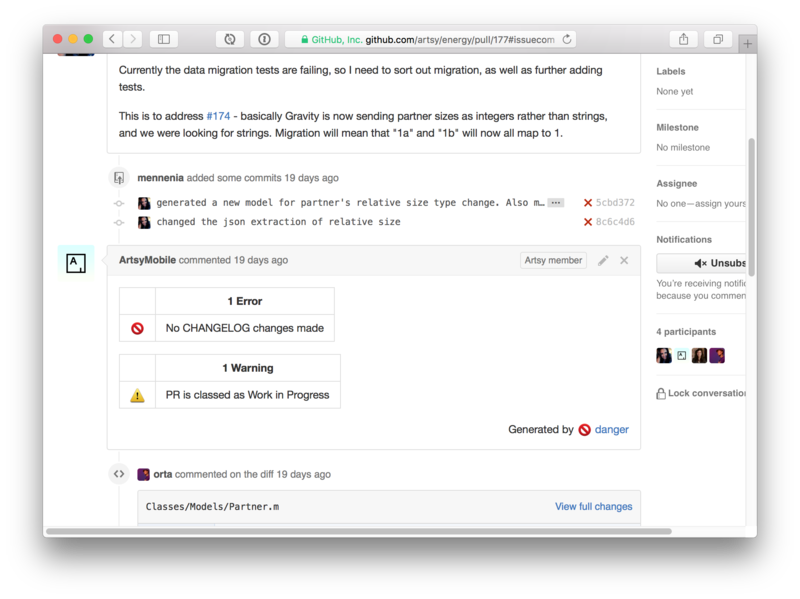 The time that we can spend on these tasks can be huge and it’s worth to spend some time setting up either Danger, Fastlane and try to automate as many processes as you can.